The LEAFXPRO will keep you dry on a damp commute, but will it be worth the effort of putting it on and taking it off the bike? Riding in the rain is something that few cyclists look forward to, but an invention making waves on Kickstarter promises to have you covered. The LEAFXPRO forms a leaf-type shape from your handlebars, over your head and attaches to a separate panel that protects your back from the elements. Its aerodynamic profile apparently means that the LEAFXPRO is easy to ride with in the wind and rain, and while it probably won’t suit your high-end Specialized race bike it could be good for a commuting hybrid. The promotional video, however, makes it look a bit of a faff to disassemble when you lock your bike up, meaning you’ll end up getting wet when you unzip yourself from it anyway. 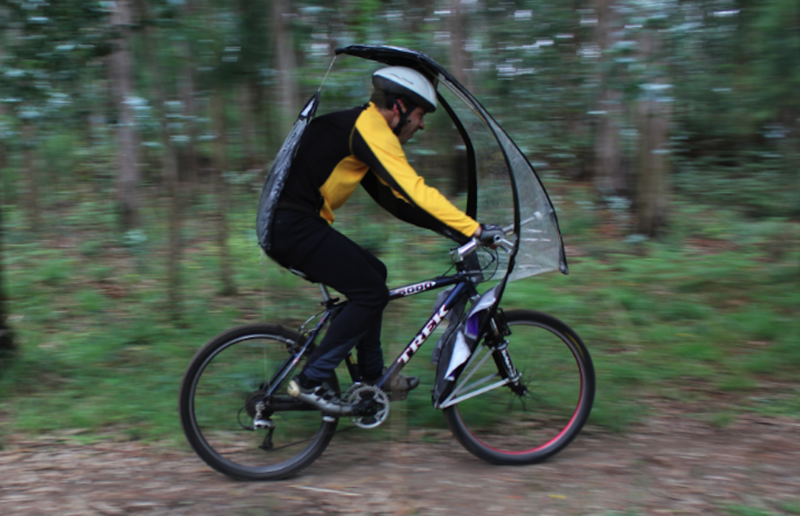 The video also shows people riding their mountain bikes through muddy, damp forests, begging the question why they need to keep their top halves dry in the first place? The company is looking to raise £20,000, and with just 21 days it is still £16k off its target. Just £99 will get you one of the LEAFXPROs and a carry bag, but you will also have to stump up £20 for shipping within the EU.